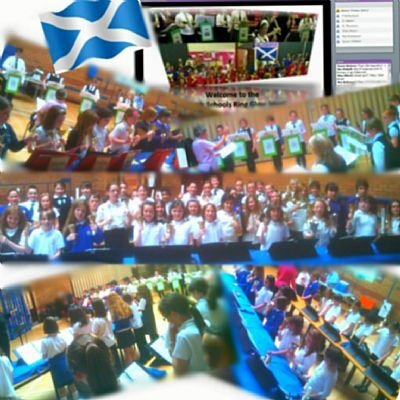 Schools with handbells, handchimes or belleplates take part in the Annual Scottish Schools Ring - an exciting afternoon of music-making with pupils from schools from around the country. This is every year in May. 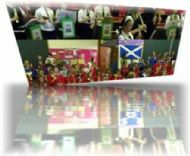 Making music through ringing instruments involves pupils in visual, auditory and kinaesthetic learning, making it attractive to pupils, and being a group instrument the spirit of interdependence and teamwork is fostered. Click here to find out more about ringing in schools. This is always a hugely enjoyable and rewarding afternoon of music making. 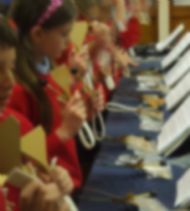 Ringers work together on 3 pieces of music for massed ringing - this music is provided at no cost to the schools, and may be freely duplicated for each participating school's use (to provide plenty of time for preparation this music will be sent out well in advance of the event). There is also an opportunity for individual groups to play a piece on their own, if they so wish. Ringing begins at 1.15pm and finishes at 3pm. Participants at the Scottish Schools Ring arrive from 12 noon - space being provided for ringers to have their packed lunch prior to the ringing beginning at 1.15pm. This also provides an opportunity to meet other schools. There will be a short interval during which refreshments are provided for all participants. ), the national charity supporting making music with handbells, handchimes and belleplates. There is no cost to participants for refreshments or music. These costs are met by the Scottish Regional Association of the Handbell Ringers of Great Britain. There are souvenir handbell pencils, erasers, rulers, notebooks available for sale on the day. For more information about this event, and if your school is interested in taking part in this event, then click here to contact Lysbeth Wilson. Click here for information about the use of handbells, handchimes and belleplates in music education.